A gunman has opened fire in a crowded shopping centre in the US state of Utah, killing five people, police say. The man was cornered by police at the Trolley Square Mall in Salt Lake City and was killed. It is thought he was shot by an off-duty police officer. Three people were critically injured and one is in a serious condition, officials said. One shopper reported hearing "shot after shot after shot" as she and others hid during the shoot-out. Authorities in the US said the gunman began shooting at about 1845 (0145 GMT). The man, thought to be in his 20s and wearing a trench coat, reportedly fired randomly at passers-by, apparently using a pump-action shotgun, sending people scrambling for cover. Witnesses said 20 shots were fired and said police eventually forced the gunman into a children's clothing store. They also reported seeing a pile of bodies. Two of the critically injured are men, aged 16 and 50, a University Hospital spokesperson said. Antique store owner Barrett Dodds, 29, said he saw a man in a trench coat exchanging fire with a police officer. He said: "I saw the cops go in the store. I saw the shooter go down." Shopper Barb McKeown, 60, who was in another antique shop, said two frantic women ran in and reported gunshots. "Then we heard shot after shot after shot - loud, loud, loud," she said. Streets outside the centre were blocked, as police swarmed around the scene. 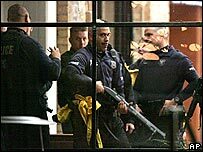 Police searched stores for hours afterwards for shocked shoppers and employees who were still hiding. Meanwhile, in a separate incident, at least four have people died after a shooting incident in the US city of Philadelphia on Monday. Reports said a lone gunman opened fire on at least four people before turning the weapon on himself. At least three of those shot were killed, while a fourth was admitted to hospital. The shooting occurred at Philadelphia's Navy Yard, a complex which has been converted to offices. Local reports claimed the shooting happened during a board meeting for one of the businesses there.